Reads magnetic stripes and barcodes printed on paper, card stock, or plastic. 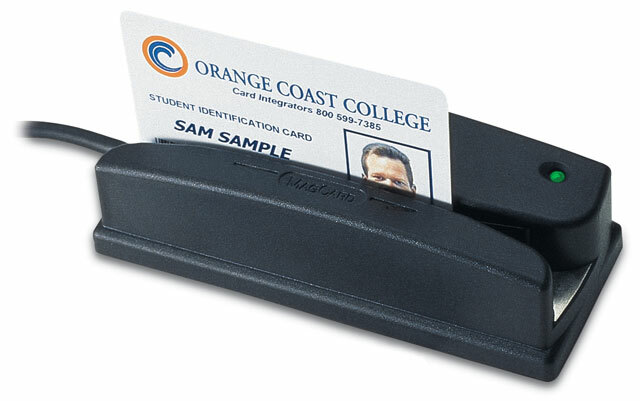 The Omni Heavy Duty Slot Reader scans barcodes printed on paper card stock or plastic. An infrared option is available for security-based applications where barcodes are overprinted to prevent duplication. The Omni reads up to three tracks of information with a single swipe in either direction. In combination the same Omni unit can read both barcode and magnetic stripe media. TTL RS-232 Keyboard wedge USB-Keyboard and Weigand interfaces are available. The Omni Reader is designed for demanding applications such as for access control or in self-service kiosks. Its die-cast metal base stainless steel wearplate and impact-resistant housing make it ideal for standalone high-volume traffic. Its metal base can be securely mounted with screws and cable exits are avaliable at the side end or bottom of the unit. A weatherproof-extended temperature version is also available for use in harsh environments. The Omni can be programmed to divide rearrange edit and validate fields of scanned data. In addition it allows for up to 16 preamble or postamble characters. Data editing for the Weigand interface can be programmed with an optional RS-232 adapter cable. The ID Tech WCR3227-600S is also known as IDTech	IDT-WCR3227-600S	or WCR3227600S	.